I may be biased, but I just love the Northwest. There is nothing more sensational than the Northwest local beauty and local bounty. Today I saw our beautiful snow-covered mountains across the clear blue water, streets with cherry trees blossoming and a beach area that was closed off to protect a young seal pup waiting for its mother. The spring days are longer now and randomly they can either seem like a warm summer day or send down sprinkling rain, making for an excellent growing environment. Shoots of chartreuse green are piercing the dark brown soil and fresh life is popping up everywhere. The spring season almost screams NEW! So to honor its arrival, we have a new menu at Salty’s. It features fresh sustainable local seafood, colorful local produce, rich local cheeses, luscious local wines, boisterous local beers and our own in-house local bakery goods. Did I mention that Salty’s is locally family owned? Ah, but why is local better? Outside of homegrown pride, the secret is in its freshness. Of course this freshness principle applies to fish and seafood, but it also definitely pertains to the fruits and vegetables we call “produce.” Have you ever thought about the word produce? You can find it in the dictionary under the word birth and along with bearing fruit and bringing forth; the earth “produces” produce! Why is local produce better for you? There are many, many reasons. It both supports our local farmers and uses less fuel to travel to its destination. It doesn’t rumble around in a truck all the way across the country, after being harvested when it was under ripe so it would better survive the trip. Instead it is quite ripe when locally harvested, allowing those important nutrients to develop to their fullest. Ripening, on the vine so to speak, not only brings better flavor but also higher nutrient content and color. Because it was just picked, it has retained more of its nutrients. There is a direct relationship between time and nutrition: the more time on the vine the better, the more time off the vine is worse. This is because many vitamins and nutrients are not stable. They decay over time. The more time that passes from harvest, the more exposure there is to light, oxygen, temperature and bruising. 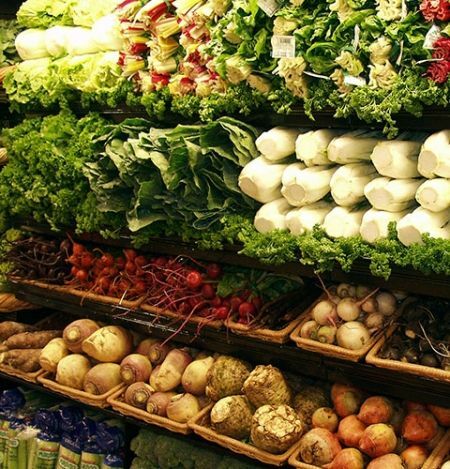 Produce contains well-known essential vitamins and also the stupendously effective phytonutrients. (We’ll call them the Fight-O nutrients because they can help take down cancer, heart disease, inflammation and even macular degeneration with a right hook and a left cross!) Carotenoids, flavenoids and sulfides are a few of those stealth ingredients. They play roles in lending obvious color to vegetables, helping bring you good health with their antioxidant abilities and anti-inflammatory properties. You can learn more at nutrition.gov then come visit us at Salty’s — the locale for local!